Water can do really bad things to chimneys. Your chimney is a hard worker. As part of your homes heating system, the chimneys job is to safely vent fumes and smoke up and out of your home. Many homeowners love the charm of a fireplace or woodstove. Others love the benefits of the lower heating costs that are associated with the use of their fireplaces and woodstoves. And, finally, some people do not give any thought to their masonry chimney because they do not have a fireplace or hearth stove. Whichever bracket you may fall into there are some important things that you should know about your chimney that could protect your family and the investment that you have made in the purchase of your home. As an integral part of your homes heating system, your chimney needs to be maintained to keep the system running safely and efficiently. Unlike most of the masonry that may be a part of the construction of your particular home, masonry chimneys extend above the roofline and therefore they are continually exposed to the sun, wind, rain, and snow. The combination of this constant exposure to the elements along with constant internal temperature changes often causes masonry chimneys to deteriorate. This is especially true when maintenance and/or small repairs aren’t made in a timely fashion. Masonry chimneys that are not protected and waterproofed properly will absorb and retain water. This water will cause damage when it freezes, and/or when it mixes with soot or creosote within the flue. If a chimney is not regularly maintained, a small job can turn into a costly major repair. What is considered a Masonry Chimney? Other than stone all of the above masonry construction materials can deteriorate as a result of prolonged contact with water. In areas where a chimney is exposed to freezing temperatures and where moisture has penetrated the masonry when it freezes and thaws, the expansion can cause stress. Stone chimneys may be immune to water but the mortar that bonds the chimney may not. Water can also cause rust in steel or cast iron that weakens metal parts. Also, when water mixes with creosote or soot within a chimney that is serving a wood stove or oil fired heater, it can produce acid that will deteriorate the chimney from within. Another potential byproduct of this water and soot mixture is an unpleasant odor in your house. 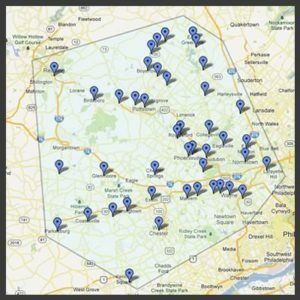 Homeowners in the Philadelphia and surrounding PA areas live in a climate that is particularly hard on masonry chimneys. Chimney caps or rain covers are one of the most inexpensive ways a homeowner can prevent water damage to their chimney. 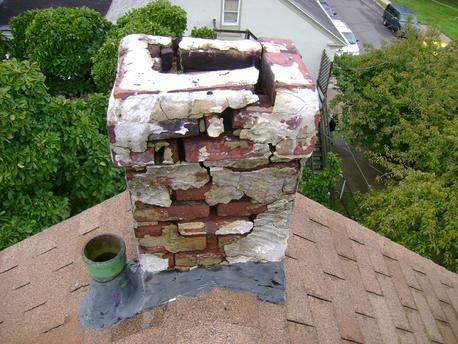 Chimney caps are a preventative measure that the Underwriters Laboratories (UL) specifies “standard” to any chimney that is considered safe and well-maintained. A chimney may have one or more large openings (called a flue) at the top that collects rainwater and funnels it directly to the chimney’s interior. This opening has the potential to allow a substantial amount of rain or snow into your chimney during the winter (when freeze/thaw cycles occur most). A chimney cap has benefits other than preventing water damage. A cap can also prevent birds or other animals from entering into or nesting in your chimney. Moreover, they can function as spark arrestors, preventing any sparks from landing on your roof or other homes or objects that could be combustible. If you own a home with a chimney, a chimney cap is advisable and well worth the investment. A professional should install it correctly. It needs to be easily removed to help future inspections and cleanings. Caps should be constructed from durable and corrosion resistant materials to ensure a long and effective service lifetime. Your cap can be designed to cover a single flue, multiple flues, a portion of the chimney, or even the entire chimney top. If you require a full coverage chimney cap, it can be a larger initial investment, but because it protects the entire chimney crown, it will provide long-term protection. A chimney crown is the top element of your masonry chimney. It covers and seals the top of the chimney all the way from the flue liner to the chimney edge. 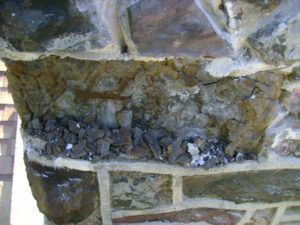 Many masonry chimneys are constructed with common mortar mix; the same mixture used to lay the bricks of your chimney. This mortar is not designed to withstand years of weather abuse and will eventually crack, chip or deteriorate and allow water to penetrate your chimney. In fact, most sand and mortar crowns will crack almost immediately after installing because of shrinkage. A proper chimney crown should be constructed with a Portland cement-based mixture and cast to provide an overhang or drip edge. It should project beyond all sides of your chimney by a minimum of 2 inches. The flue liner tiles should project above the crown by a minimum of two inches, as well. If damage or deterioration already exists, your chimney should be properly repaired, and a waterproofing agent should be applied to prevent any further damage. For a safe and efficient operation, your chimney should be checked annually by a CSIA Certified Chimney Sweep. It should also be cleaned as needed. Every year, unsafe chimneys cause significant numbers of deaths and injuries. They account for more than $200 million dollars in property loss. Call Antrim’s, A Good Sweep Chimney & Masonry Service, we can answer any of your chimney questions.